Is there a better alternative to Math Stars Plus? Is Math Stars Plus really the best app in Mathematics category? Will Math Stars Plus work good on macOS 10.13.4? 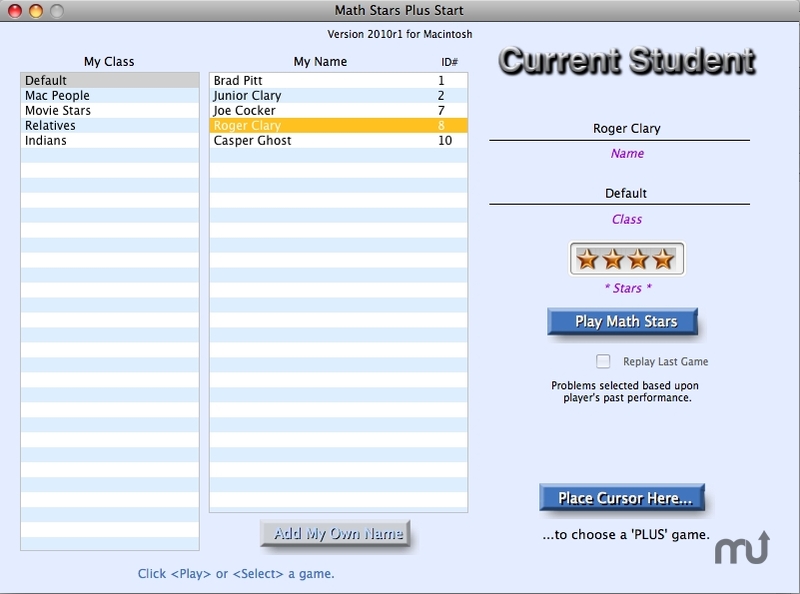 Math Stars Plus, a program for mastering math facts in its initial release, expands upon features of Class One Software's Math Stars. The basic module of Math Stars Plus challenges students to complete all fact groups up to a selectable number. As each function is successfully completed, the student earns a STAR. When 4 stars have been earned, the student's name is entered into the Hall of Fame. The program records every problem the student attempts and can be set to use the student's previous data in selecting new problems. Math Stars Plus needs a review. Be the first to review this app and get the discussion started! Math Stars Plus needs a rating. Be the first to rate this app and get the discussion started! In addition, Math Stars Plus includes 6 fun but challenging math games. The games range in difficulty from fairly easy to quite challenging even for advanced high school players. Students compete against their own best time or highest score in each game. The PLUS games are not counted in the student's quest to complete the facts for each function. User selectable options include: time limit per question, number of problems, random or fixed numbers, allow negatives, vertical or horizontal display, and highest number allowed. Problems can be created by the program based upon the student's previous efforts, truly at random, or from a list of teacher-created problems. Users can select addition, subtraction, multiplication, or division functions or determine which of those functions will be randomly selected by the computer. Its many options make this program adaptable for students of all ages. There is also a Primary setting which simplifies the program for young users. Problems can also be spoken aloud by the computer voice for the visually challenged.